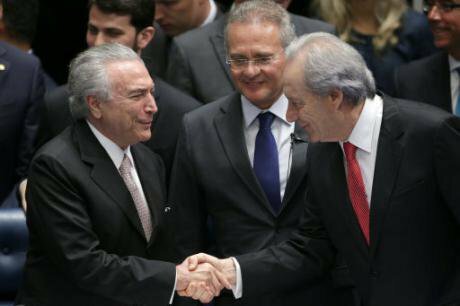 President Michel Temer shakes hands with Supreme Court Chief Justice Ricardo Lewandowski as Senate leader Renan Calheiros, center, looks on during Temer's swearing in ceremony. Aug. 31, 2016, Brasilia. AP Photo/Eraldo Peres. All rights reserved. With a rom-pom-pom, the Brazilian Marine Corps brass band introduced the national anthem and brought a packed Senate to its feet. Scanning over a sea of bald heads, rarely interrupted by islands of crimson- or mauve padded shoulders, the TV Senado camera homed in on the vampiric figure of Michel Temer, whose lips barely curved as words escaped from the side of his mouth, as if in an act of ventriloquial deception. ‘But if thou raisest the strong gavel of Justice/Thou wilt see that a son of thine flees not from battle’. Little more than two hours after senators had voted in favour of the impeachment of President Dilma Rousseff, in the very same chamber, Temer was officially instated as the new president of the republic. In the nearby Alvorada Palace, Dilma, vested in the red of her Workers’ Party (PT), surrounded by supporters, had already pronounced to a pack of journalists that she had been ousted by a coup d’état. Coups, democratic rupture, and unelected government are the rule in Brazil, not the exception. It was a coup, organised by military men, that established the republic in 1889. Getúlio Vargas, one of Brazil’s most loved presidents, took power in a bloodless coup in 1930. Then, after a short period of constitutional rule beginning in 1934, he established the ‘Estado Novo’ (‘New State’) through a self-coup in 1937. Vargas was deposed in 1945 by a military coup that led to the reintroduction of presidential elections. Less than twenty years later, the military coup of 1964 plunged the country into the darkest period of its modern history, during which a murderous dictatorship proscribed political parties and clamped down on free expression. Even during the country’s three brief experiments with representative democracy (the first of which restricted the vote to white, literate males), few presidents who have come to power through the ballot box have remained in office until the end of their mandate; just two since 1985. Coups, democratic rupture, and unelected government are the rule in Brazil, not the exception. If ruptures in governance have differed in consequence and design, their architects have invariably presented them as necessary to modernise Brazil and propel the ‘country of the future’ towards its destiny. History has been the pretext for cynical politicking, intrigue, and sabotage that have reconfigured, and usually shrunk, the space for democratic contestation. History has trumped politics, with the positivist ideal of ‘order and progress’ proclaimed as guiding the transformation of a backwards ‘banana republic’ into a serious, civilised, and developed nation state. Dilma’s impeachment represents yet another rupture in Brazilian democracy, albeit not one brought about through a fundamental break with the constitution. The contours of a coup took shape in the alignment of conditions that enabled the parliamentary process, and in the convergence of interests of a cadre of corrupt political elites and an opposition indignant at having lost a fourth consecutive election. This became most obviously clear in May of this year, when Senator Romero Jucá was recorded in conversation with an influential businessman, saying that there was a need for a pact and a change of government through impeachment in order to stop corruption investigations; that members of the Supreme Court were aligned in their desire to remove Dilma for this same reason; that military leaders had offered their guarantee of her removal, if required; and that the best option was to install Temer at the head of a ‘government of national unity’. Article 85 of the 1988 Brazilian constitution sets out a provision for impeachment when the president commits a ‘crime of responsibility’ against the constitution, the Union, or its laws. The case against Dilma, dizzying in its technical detail, rested upon two accusations relating to 2015: that she signed three decrees to increase credit for expenditure on social programmes without congressional authorisation; and that she delayed payment to a public bank for money spent on a government agricultural programme. It was only at the end of 2015, more than six months after the delayed payment in question, that the Federal Court of Accounts (TCU) decided that such delays are illegal. The coup was confirmed when senators decided that Dilma’s accounting irregularities constituted crimes of responsibility, thus accepting a new and post-hoc interpretation of the country’s budgetary laws, not previously applied to prosecute presidents and governors for similar deeds. In removing the elected president for ostensibly political reasons, the impeachment of Dilma is a coup against democracy. At least in the short term, Brazilians will be unable to directly contest the implementation of a political project that they have consistently rejected. Temer’s plan for government, ‘A Bridge to the Future’, reveals that impeachment is another coup against politics in the name of History. And it is a very contemporary coup against politics. In leaving the constitution only stretched and bruised, it is a coup in the name of legal-constitutionality. In criminalising profligacy and assistentialist politics, it is a coup in the name of fiscal responsibility and the common sense of the neoliberal age. In the short term, Brazilians will be unable to directly contest the implementation of a political project that they have consistently rejected. The misjudgements and misdeeds of the PT government played a crucial role in its own collapse. If the PT’s years in power do not confirm the Deleuzian idea that there cannot be government ‘from the left’, they at least leave a record of the many challenges faced by a heterogeneous left-wing party when it is chosen to govern and it has to compromise and form alliances. For now, renovation and unification of the Brazilian Left will be pursued primarily in the streets: a more habitual environment. The PT in government developed its own brand of anti-politics: a moralism that demonised opponents (and ultimately backfired with the exposure of corruption scandals); a cult of personality that shifted attention from policy to Lula’s history and character; and a rejection of dissent on economic policy that fostered anti-intellectualism. Temer’s assault on politics already looks more sinister. In a Galeano-esque upside-down-land, where a coup is presented as the exercise of legal authority, and corrupt politicians are congratulated for their exemplary conduct in its execution, the old-style chicanery of Brazilian political elites is bound to thrive. Having voted for Dilma’s impeachment, senators voted against her banishment from public office lest they set a precedent that could affect them in their own impending trials. Two days after Dilma’s impeachment, the new administration approved a law making it legal for the government to obtain more credit through decree without authorisation from Congress. Temer’s inauguration was presided over by Renan Calheiros, the president of the Senate, who is currently subject to eleven investigations, mostly to do with corruption. Having declared Temer president, Calheiros turned to shake his hand and, in a hushed voice that nonetheless carried over the microphone, said: ‘We’re in this together’. As if it was ever in doubt.